The European standard for controlled door closing devices is BS EN 1154 and only closers with this accreditation should be fitted to fire-resisting door as referenced in approved document B of the Building Regulations 1991. Door closer are available in different power sizes, this is a means of varying the spring compression by increasing or decreasing the spring tension. It’s very important to ensure the correct power size is specified otherwise the door may either not fully close the door or may be too stiff in its operation for people to use. Example an average 30 minute fire door 2100mm (h) x 830mm (w) x 44mm thick would use a power size 2- 4 adjustable closer. 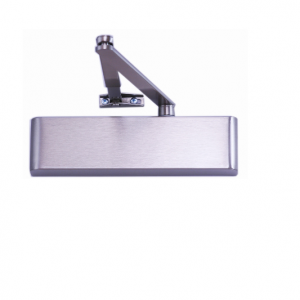 Door closer can be fitted in 3 different ways Figure 1 – The closer is mounted on the pull side of the door with the arm fixed to the frame. This is the most popular fixing and the most mechanically effective. Figure 61- The closer is mounted on the push side the frame over the door. Figure 6 – The closer is mounted on the push side of the door and the arm is fixed to the frame using a figure 66 bracket. Please note if you are using the closer in the figure 6 configuration you will need to add a power size to ensure the door will close correctly. Always helpful with a swift service – would happily recommend to anyone interested in alarms.